Make your own group and travel with us in the Steps of Apostle Paul! 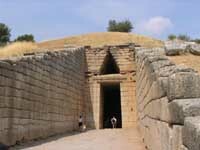 Visit the Greek cities of Athens and Corinth to see the sites associated with Paul's ministry. Join a luxury cruise to Greece and Turkey including Istanbul, Ephesus and the beautiful Greek islands of Mykonos, Patmos, Rhodes, Crete and Santorini. Visit some of the most amazing Byzantine monasteries and Christian Monuments in Athens and surrounding areas.